WHEN he arrived in Castlebar from the Cameroon in February 2007, ten-year-old Noe Baba had no English so he used to have to stand in goal during the lunch-time kickabouts in St Pat’s Boys’ NS. It was, he recalls, impossible for him to play outfield because he didn’t know how to call for the ball in English. 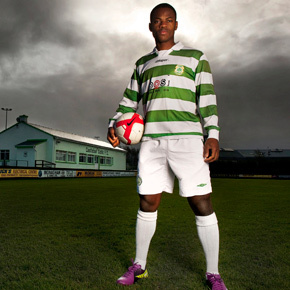 Now, Noe Baba is one of the hottest young properties in Irish soccer with Manchester United inching close to signing him. However, the 15-year-old remains wonderfully unaffected by it all. He’s a refreshing interview subject; confident yet humble, passionate and thoughtful, humorous and sensitive. Those who have worked closely with him praise him as much for his character off the field as for his talent on it. Why becomes apparent quite quickly. WITH some extra English classes in St Patrick’s NS in Castlebar, Noe (pronounced No-ah) Baba gradually began to settle in five years ago. A group of lads in his class took him under their wing. One of them, Darragh Coll, lived close to Noe in Rockvale in Castlebar and his father Noel, a Castlebar Celtic stalwart, saw plenty in the evening kickarounds in the estate to ask his son to invite Noe along to Celtic U-12 training. Around the same time, Baba picked up his first ever soccer medal with the school, a Ribena 7-a-side Connacht title which introduced him to the winning feeling for the first time. He had played soccer for fun in the Cameroon but winning a medal changed his outlook. Initially at Celtic he fell in with the U-12 ‘B’ team, because all of his friends were there. It wasn’t long though until his talents compelled him into the ‘A’ side under the tutelage of Denis Ahern and Gerry Conway. Ahern, in particular, was a huge influence on Noe’s development, something both Noe and those at the club testify to. That U-12 team won the Mayo League and Cup double and Noe Baba was called-up to the Mayo squad. There he met the FAI Development Officer for Mayo, Paul Byrne, another man who he considers a hugely positive influence. It was little surprise that Baba was brought into the prestigious Kennedy Cup squad (U-14) whilst still underage for the next two years. It’s believed he’s the only player to ever play for three Mayo Kennedy Cup squads. Paul Byrne spotted the makings of a centre-back in Baba and it’s from that position that he has predominantly played for and captained Ireland. “Noe is very good at playing in a number of positions. In fact we put him in goal during one of the trial games for Connacht when the three goalkeepers were injured and because we didn’t need to trial him outfield. He turned out to be better than any of the goalkeepers! “But I do think that, at a higher-level, centre-back is where his future lies,” Paul Byrne told us. AS he sips on his hot chocolate in the TF Royal Hotel in Castlebar, Noe laughs at the memory of scoring two own goals in his first Irish training session in 2009, but it was no road block to his progress. He now has 11 caps to his name with the Irish U15s and 16s. He is quick to pay tribute to the role the FAI’s Niall Harrison played at this stage of his development. “I just can’t describe how important he was for me. Even though I was young [Baba was capped first as a 13-year-old], he just kept me feeling I was part of it. Even sometimes when you feel like an outsider and don’t feel part of the team, Niall made me feel like I was part of the group. That was really great for my confidence. “By the time I was done with Niall I reached a point where I feel like I am capable of doing a lot of things. I can be the best I can when I’m working with the right people,” he added. He’s now considered arguably the finest talent in the Irish U-16 side and English clubs have been doing more than just taking note. Clubs who have had him over read like an introduction to Match of the Day. Manchester United, Arsenal, Manchester City, Everton, West Ham, Birmingham, Newcastle, Blackburn and Fulham have all had a closer look. So too have Glasgow Celtic. Manchester United appear to be leading the chase at the moment. Noe travelled with their U-17s to Brazil recently and they look the most likely at present to sign Baba next summer, when he turns 16 — the minimum age for a contract. But while such coveting would go to the head of many 15-year-olds, Noe Baba is philosophical about it. “My dream is to be a professional footballer and if you want to make it, there are some decisions you are going to have to make and maybe that’s moving over [to England]. “At the moment I’m here, playing with Celtic. The rest of it, dad deals with it. Whatever happens, happens. Noe laughs when you suggest that joining Manchester United might be hard for someone who supports Liverpool. “When I’m watching a match, I don’t just support a team. I pick out mistakes, styles of play and different players. I’m a Liverpool fan, I won’t deny it. But if they are not going well it won’t bother me as much as it will a proper fan. It [wanting to play with them] is not the be-all and end-all,” he explained. And then there’s the other dream — to play senior international football with Ireland. So much becomes obvious when he tells you of a recent trip for two U-16 games in Portugal. He concedes that he wasn’t in a great head space going out but he felt a responsibility to deliver. He didn’t. Ireland won the first game and drew the second. The man of the match in the second game was the Irish captain, an immigrant from the Cameroon who now proudly calls Castlebar and Ireland home.